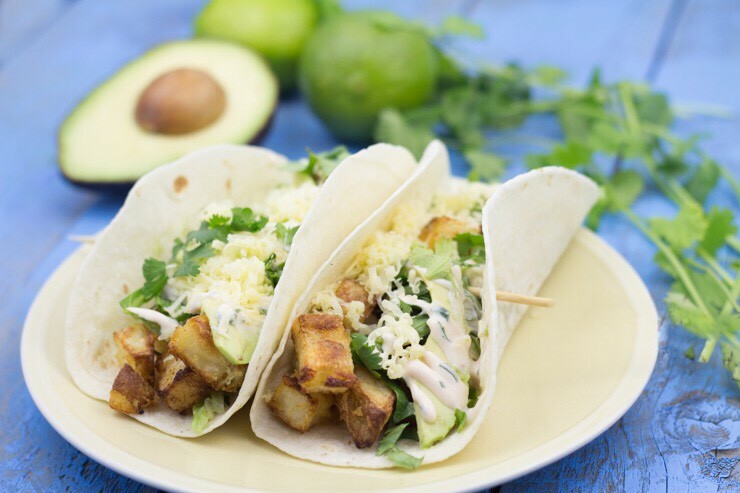 Spicy Potato Soft Tacos– Crispy, oven-baked & seasoned potatoes with a spicy sriracha lime cilantro sauce. The star of this quick concoction could be debated. It could be the crispy potatoes with a smooth, fluffy interior, or perhaps the spicy sriracha-based cilantro lime sour cream sauce. We might as well go ahead and call it a tie, because they are both absolutely delicious! These tacos may sound somewhat familiar if you venture out into such fine dining establishments as I have recently. You know the one… Cardboard-like nachos, belly-aching quesadillas, and these recently added dollar menu jewels. Good ol’ T-Bell. I have been addicted to these simple tacos since their recent addition to the menu. Finding a good homemade recipe to replace them was quickly added to my To Do list. Let’s talk about this sauce. This sauce has been my go-to spicy sauce for everything from fish to burgers to tacos. It’s incredibly simple and can be blended to add just a tingle or knock your britches off– whatever you prefer. 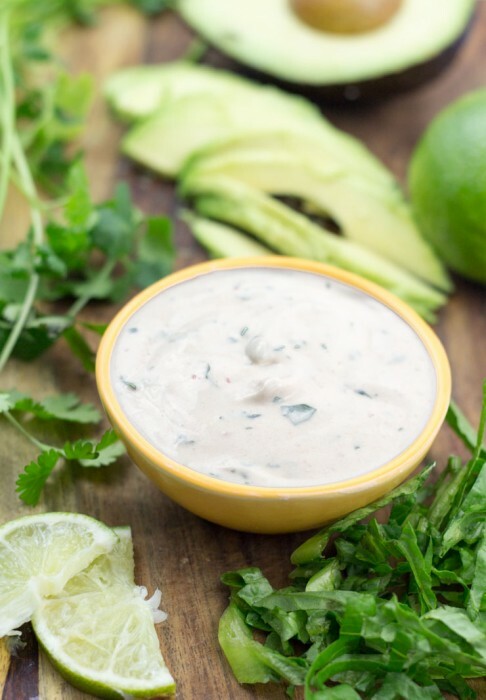 Sour cream, a bit of freshly chopped cilantro, a bite with a splash of lime juice and some spicy, flavorful sriracha. Check out some of the other recipes that we have used sriracha in while you’re at it. Taco Tuesday is definitely going to make an encore appearance throughout the week with these! 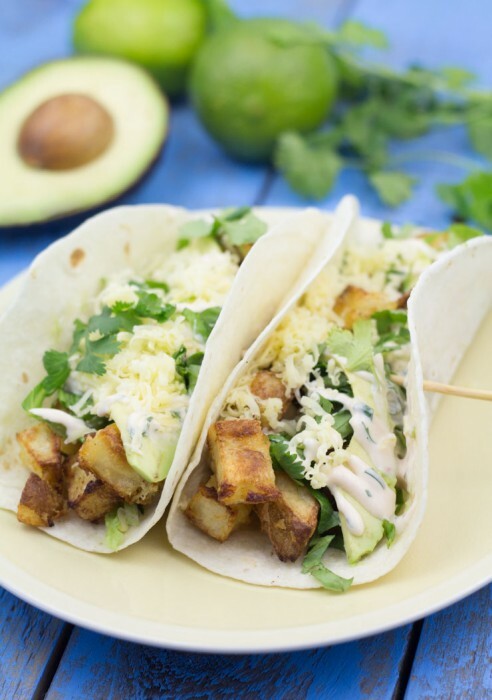 Spicy Potato Soft Tacos -- Crispy, oven-baked potatoes with a spicy cilantro sriracha lime sauce for the perfect homemade soft tacos. 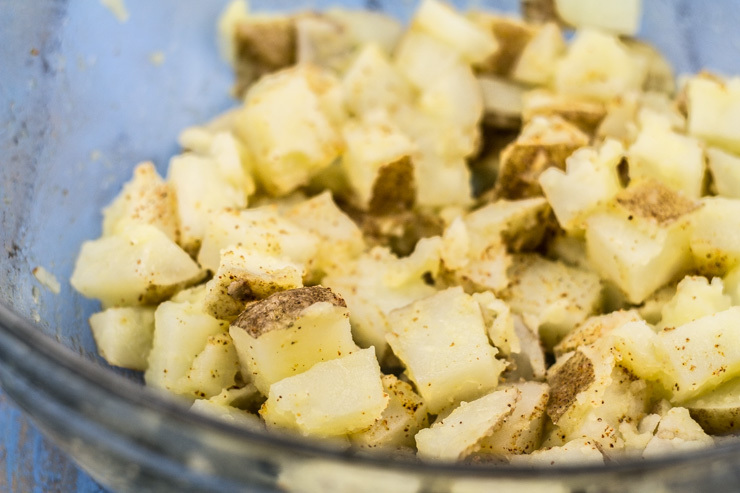 Rinse cubed potatoes in cold water several times until water is clear. In a microwave safe large bowl, place potatoes and cover with water (about an inch over). Cover with plastic wrap and poke a few holes in the top. Microwave on high power for about 5 minutes. You want a knife to just pass through when poked. They shouldn't be too soft, though. In a bowl, drizzle olive oil and seasonings on potatoes. 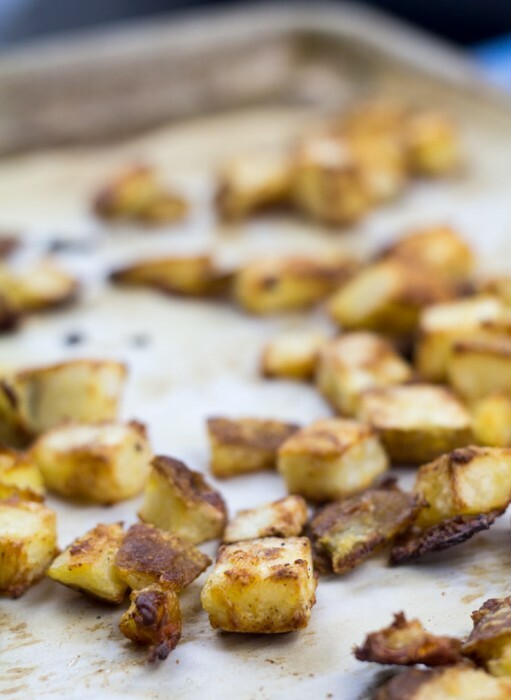 On a paper-lined baking sheet, spread potatoes out in single layer. Bake for 15 minutes, flip, bake an additional ~10 minutes until golden and crispy. For sauce, combine sour cream, sriracha, lime juice and cilantro. Set aside. In tortilla, add warm, crispy potatoes. Top with toppings and spicy sauce. This was a great way to make dinner in a hurry, plus it is cold dnow on the ground and more of the same for tomorrow. We have everything but the sriruche – noe we do have a spicy dipp for lite sour cream with every thing , two teaspoonful to a cup of sour cream. Thanks from “what to do for dinner and the kids” oh ,please no email listing, we have kids, in school. Thanks. So glad you enjoyed it! No worries — I don’t add anyone to my emails unless they sign up on the site. 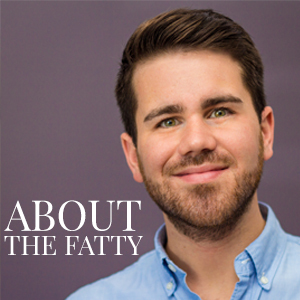 Don’t you dare even mention Taco Bell near your delicious food. No contest. Not in the same world. I love this concoction of potatoes and avocado. You could easily add in a scrambled egg too. Great recipe. OMG. I am so addicted to these from TB. I just had one of these today (okay two). That won’t stop me from making these tonight however. Thanks so much from making a recipe. Hah! I feeeel ya, Carrie. No judging here 🙂 If you want to get a bit closer to their version, consider adding some chipotle in adobo sauce to the sour cream mix. Pretty sure that’s where their heat comes from instead of sriracha. Let me know how they turn out! I made these last week over the break and let me tell you they were amazing! I made both sauces and both were well liked but i think the chipotle one was slightly better (only by thismuch). Great! I’ll have to give that a try. I make the sriracha one fairly often and it just seemed easier to throw together at the time I was making these for dinner. Glad you enjoyed them!